What I have is a house built in 1952. I purchased in 2017. It's has baseboard water heat with boiler. The boiler has a side-arm providing hot water to the house. The system has 3 zones + side-arm. The house is 650 sq. ft. above ground and 600 sq. ft. basement. 2 zones provide heat to the main house and 1 zone provides the basement. There's only one thermostat. It worked fine for about a year. Then it started not turning off a zone. That zone that didn't turn off would be over 80 degrees while the other zones turned off as expected. It's not always the same zone that won't turn off. It's annoying, concerning, and costly. I'm not sure where/how to troubleshoot. After reading the post referenced above I'm thinking may be the thermostat doesn't have enough power/juice to operate all 3 zone valves at once. Should I just change the thermostat and see what happens - step 1 in troubleshooting? Am I making sense? Any suggestions on how to remedy? Here are some pics which will hopefully help. 1 of the thermostat. 1 of the zone valves. and 1 of the back side of the zone valves where the wiring exists. You shouldn't just change the thermostat. You assessment is wrong about 'enough juice' and if it were right, the new one wouldn't have 'enough juice' either. If one zone is overheating, to me that means there's a short in the wiring that's keeping that zone valve open, or there's something stuck/lodged/broke in the valve body (or it's worn out) not letting the valve close or properly seal. My main thinking is there seems to have been some recent work done on the system-water feeder, BFP and circulator, and something could've lodged in there or soldering could've damaged some low voltage wiring. I have to tell you 3 zones for a house that small is not the best approach. You'd be better off with the tstat controlling a delta P circulator and sensing temperature in the main room (where the tstat is located), and TRV's working the other 2 zones. Or even one zone and balancing valves to balance the flow to the throughout the house. But TRV's would be easily controllable and more accurate. It's not the thermostat. That's just a simple on/off switch. As @STEVEusaPA said, something is keeping the offending zone valve powered or jamming it open -- and since it isn't always the same valve, it may take some real ingenuity to find. Next time it happens with an offending zone, check the lever on the zone valve. If it moves freely, then theres probably 24v to the motor, unless the linkage is broken. If there's tension to manually open it, then its bypassing the ball seat. 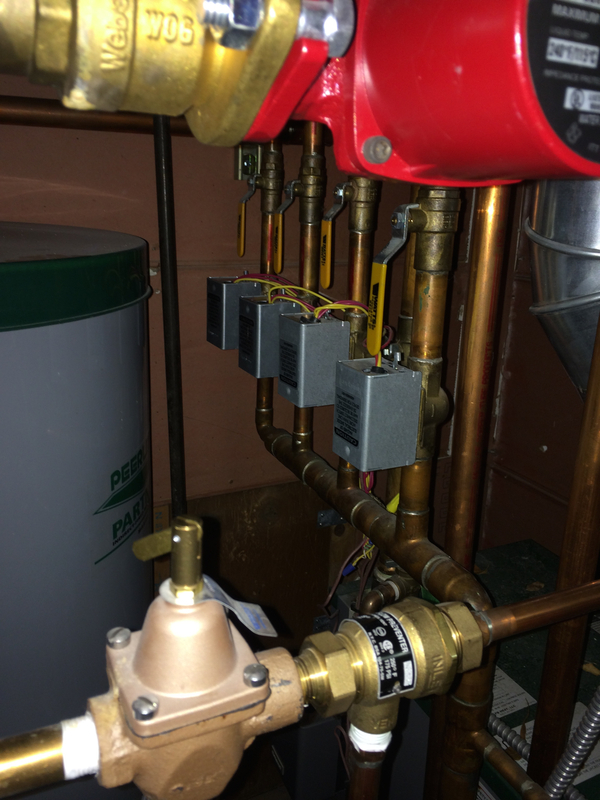 But with 3 zones valves connected to one thermostat, (BTW add up the mA for the zone valves and aquastat and set the thermostats heat anticipator to that total) is it possible it randomly happens when the indirect zone is running? Is that what the fourth zone valve is for? If I don't reply specifically to your comment, it doesn't mean your comment fell on deaf ears. All information is helpful to me so THANKS! Every time it happened the lever of the offending zone valve has moved freely. The upstairs zones are the ones that have malfunctioned. One of them contains the tStat. Yes, the thermometer on the thermostat reads higher than the setting on the thermostat when that zone decided to not turn off. My understanding is the “end switch” in the zone valve is what sends command(s) to the pump and boiler to start pumping hot water. So, even if the ball seat was being bypassed, there's no request from the malfunctioning/clogged zone valve for hot water (resistance in manual lever). This spawns another question: When all valves were off, I turned the tStat all the way down so the tStat would not trigger anything. I then wanted the operate the zone valves manually. My thinking is that when the manual switch in the zone valve is locked in the open position the end switch would put out a request to pump hot water. That didn't happen. How come? What's the sense on being able to manually open a zone valve if the end switch isn't going to activate the boiler and pump? I assume v is volts and mA is milliamps, please correct me if I'm wrong. This is what makes me think the tStat may not have enough “juice” to trigger all the zone valves with a single signal. Where would I find the mA requirements? The space is crampt so knowing where to look and what I'm looking for would be good. The fourth Zone Valve works with, unless I'm mistaken, the side-arm providing hot water to the faucets. 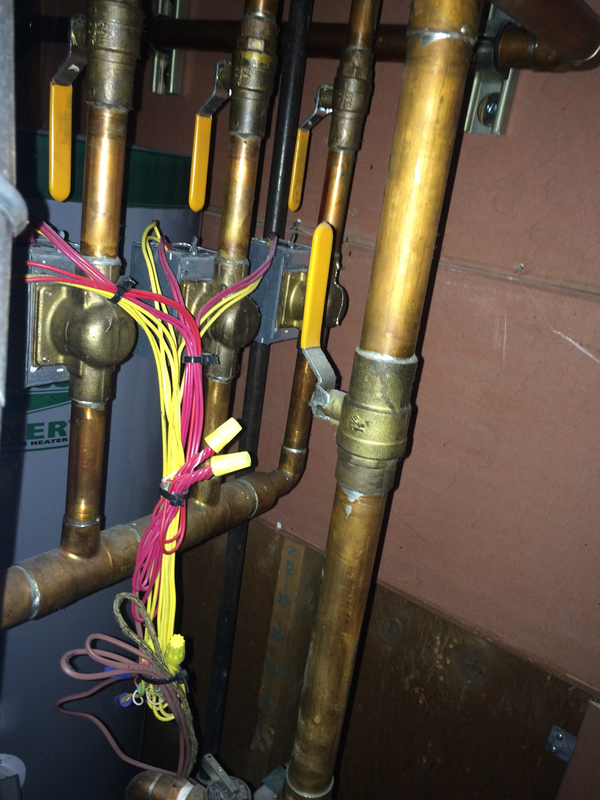 Not sure if hot water was being delivered to a faucet when zone valve malfunctioned. So I don't know if that has anything to do with the random nature of the malfunctions. Next time it happens, I'll remember if I was using hot water. My thermostat is the one pictured. There's no manual on/off switch – only a thermometer and a setting. When I pull the cover off to look inside, there's only a bulb with mercury, a coiled spring, and a couple of wires. Not sure if what I see behind the coiled spring is the heat anticipator. But the heat anticipator has a mA setting? From what I read (seconds ago – meaning it's all brand new to me) is the heat anticipator merely fine tunes when the signal to shut off heat is sent to the heating system. It's based on heat not on mA. Please correct me if I'm wrong. 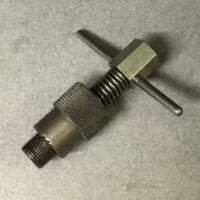 There's an inline mechanical valves on each of the zone pipings just after the zone valve. What happens if I shut that valve off when the zone valve is malfunctioning? Does the pump keep pumping even though there's no flow – thereby stressing the pump and causing it to fail over time? There's a master switch that is just a regular light switch. I was told when I bought the house that switch is the master and just shuts it all down. Can I switch it off and then on without concern? I mean is there some kind of start up sequence that needs to be performed when the system power is turned on from off? And I assume that if I turn the whole system off at the master, I will not have any hot water running at the faucets while the system is off. And further the water in the holding tank/boiler will start cooling. Is that correct? Well, a comment or two on the thermostat itself. 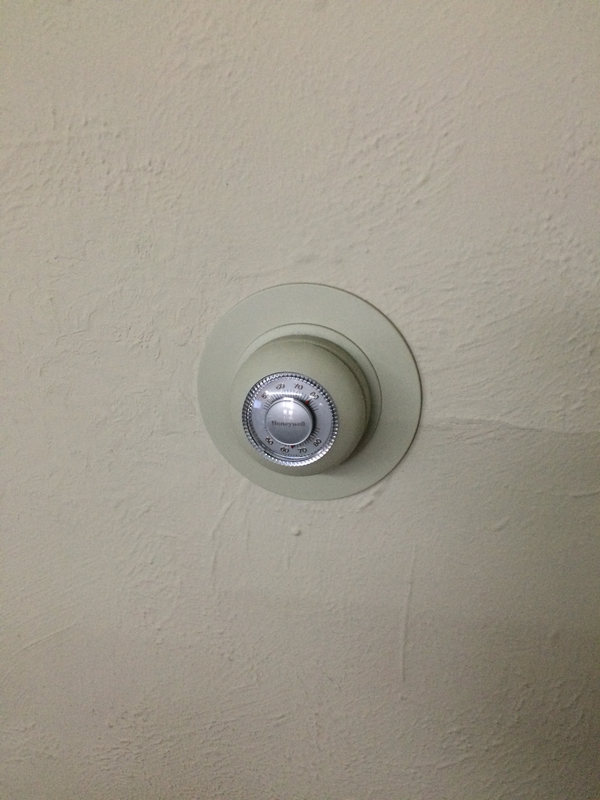 First, it is a simple on/off switch. That is the mercury bulb. If it's tipped one way, so the mercury touches the contacts, it's on. If it's tipped the other, it's off. There's no juice in the thermostat -- no source of voltage. The markings on the anticipator are in mA, and give an approximate setting. The purpose of the anticipator is to heat the thermostat a little -- enough for it to sense the room being heated faster than it really is. Thus the thermostat will shut off a little early, and the heat stored in the radiators will finish the job. You set it initially at the mA draw of all the connected devices -- but then you may need to fiddle it one way or the other to eliminate overshoot or undershoot. Now it is possible -- since you seem to have three zone valves hooked to the same thermostat -- that the 24 volt transformer powering the system isn't big enough. That's not the thermostat's problem, that's the transformer. That does not seem to be your original problem, either, however. And yes, the way the system should operate is that the thermostat should signal the zone valves to open, and their end switches should signal the pump and boiler to run. On the master switch -- which is very likely exactly what it looks like, an ordinary light switch -- there is no real harm in shutting it off when the system is running, nor is there any start sequence required other than what the burner controls themselves have for turning it back on. That said, many newer systems have a post-purge feature on the burner controls; if yours does, it's best practice not to turn the master power off when the burner is running, as it will stop immediately rather than run it's post-purge. Keep in mind that that switch is intended only to shut the system off if it is malfunctioning, not to simply control it. Overall, I suspect that you have at least one and probably several wiring problems -- damaged wires, erroneous connections, etc. -- and the wisest thing to do would be to figure out -- or have a competent tech. figure out -- how it should be wired, and rewire it.